‘Tis the season to begin considering your garden, and potatoes are a good place to start. If you missed the recent workshop on growing potatoes in a sack (complete with said sack and potatoes) it’s not to late to get the skinny on how what conditions create the best results. Plant potatoes in full sun, and avoid freshly limed beds. Potatoes like slightly acid soil with a pH of 6.0 – 6.8. Organic matter in the soil will improve your crop, but use well rotted compost or dig in a cover crop the previous fall. Avoid fresh manure. 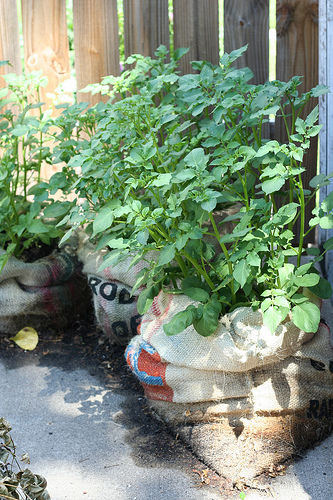 Once you plant your potatoes, don’t water them until after you see the plants sprout above ground. This will help to prevent soil diseases from affecting your crop. Once they’re growing, keep your potato plot evenly moist, particularly once the plants begin to bloom. For fresh eating of baby or “new” potatoes, wait until the plants are in bloom. That’s usually a good indication that an early summer harvest is ready. For storage potatoes, wait until the plants wither and turn brown, and then leave them in the soil for a further 3 weeks as their skins firm up. Harvest them for storage if there’s a threat of very cold or very wet weather. This entry was posted in Urban Gardening and tagged Urban Gardening, West Coast Seeds on March 30, 2011 by local delicious. Two women in East Vancouver have banded together — and brought their neighbourhood together — over the shared efforts of gardening. Dubbed the “Two-Block Diet,” neighbours Kate Sutherland and Julia Hilton have started a neighbourhood food revolution and with it cultivated a community, barn-raising bond with the people who have joined them. In a busy city with busy lives I’ll bet they would never have otherwise met, despite the fact they all live a stone’s throw from each other. The Two-Block Diet showcases all that I believe is great about how food brings people together and builds community. Read the full, Vancouver Sun article and be inspired to create your own Two-Block Diet and neighbourhood network. The only way to get more local than a Two-Block diet is to have a garden in your own back yard! This entry was posted in Industry Issues, Urban Gardening and tagged food security, Two-Block Diet, Urban Gardening, Vancouver Sun on September 29, 2010 by local delicious. 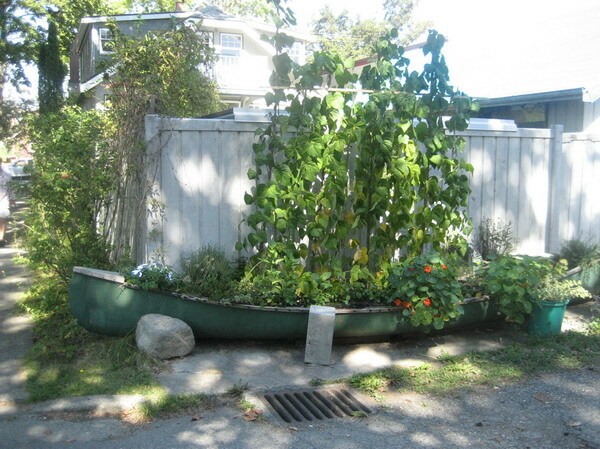 Last week I blogged about being able to grow things anywhere, after seeing a canoe garden in a quiet residential alley not far from my community garden. If you don’t have a canoe but you do have say, an old truck, that can work too. From the duo who brought us King Corn, learn how to “teach an old dodge new tricks” in this trailer for the upcoming Truck Farm movie. It’s kinda crazy and a whole lot of fun. You can find additional Farm Truck clips on the Wicked Delicate YouTube channel. This entry was posted in Movies, Urban Gardening and tagged Farm Truck movie, King Corn movie, Urban Gardening on September 22, 2010 by local delicious. If you really want to garden, you can garden. All it takes is a little creativity. One East Vancouver resident converted a parking space into a garden on the rental property she shares. In my condo the rooftop deck is surrounded by tomato plants bent double with fruit. Do you have a creative urban gardening solution? Share your pictures via email to liz [at] localdelicious.com. This entry was posted in General, Urban Gardening and tagged micro garden, square foot garden, urban farming, Urban Gardening on September 15, 2010 by local delicious. Here’s a great — and extreme — example of a family taking ownership of their food supply. It’s proof that even a small amount of land can give us much more than we may imagine is possible. Be inspired! We have a great community garden program here in Vancouver, BC but there are always more people who want to garden than there are available plots. I’d love to see more people with land share it with the people who want to garden. If you’re interested, check out Sharing Backyards. Find more inspiring videos at KarmaTube.org. 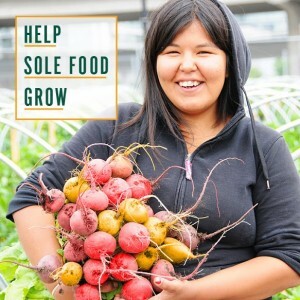 This entry was posted in Organizations, Urban Gardening, Video and tagged Homegrown Revolution, KarmaTube, Sharing Gardens, Urban Gardening on January 29, 2010 by local delicious. 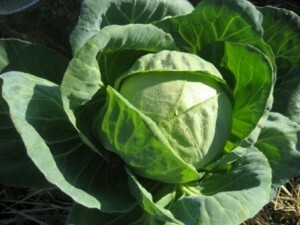 I grew a beautiful plump head of cabbage and was waiting for the mood for soup to strike before harvesting it. However, before I could get there, it was stolen from my community garden plot. They planned ahead and seemed experience. They’d brought a knife, and it was a clean slice that took only the head and left the outer leaves. If the individual in question was truly hungry, I’m happy to have my cabbage go to a good cause — though apparently even the starving don’t like Brussel sprouts, as these remained untouched. I had a tarp go missing as well. My thought is that if someone is truly hungry enough to take a cabbage, then maybe they are exposed to the elements on a daily basis and the tarp will aid in keeping them dry. This entry was posted in 16 Oaks Community Garden, Bumbling Gardener, Urban Gardening and tagged Urban Gardening on December 14, 2009 by local delicious. Can Cities Aid the Food Crisis? I enjoy urban gardening for the sense of community it builds with my neighbours, for the fun I have mucking about in the dirt, and for the delight in every bit of harvest. Especially the warm, juicy, bright red tomatoes that ripen on the vine. However, there’s a much bigger impact on the state of our food security, one that I don’t really think about as I’m fussing over seedlings or harvesting peas. Alone I’m just a small drop in the bucket, but together we make a difference. If you haven’t given much thought to how much your little garden contributes to world agriculture trends, David Tracey’s article in The Tyee, Why Urban Farming is the Future, is worth a read. And, if you want to garden and don’t have access to land, try Sharing Backyards, a program that connects people with urban land with those who love to garden. This entry was posted in Industry Issues, Urban Gardening and tagged The Tyee, urban farming, Urban Gardening on August 18, 2009 by local delicious. The community garden plot is well underway, but it will be a while before there’s any harvest to show for all the water lugged to sustain it. 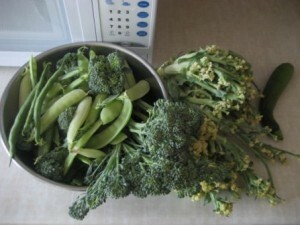 Meanwhile, the original, tri-plot, “borrowed” garden has continued to produce plenty of healthy kitchen goodies. My last harvest of July included my first crop of cauliflower. 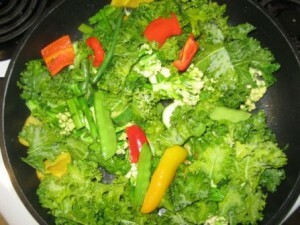 It doesn’t look “normal” but it cooked up just fine in my super supper stirfry. The stirfry included the cauliflower, broccoli, snow peas, green beans, kale, cabbage, and a variety of herbs from my balcony garden. In fact, the only thing in the dish pictured that didn’t come from my garden are the red and yellow mini sweet peppers, which came from the farmers market last weekend. This entry was posted in Bumbling Gardener, Urban Gardening and tagged Urban Gardening, zero mile diet on August 5, 2009 by local delicious.